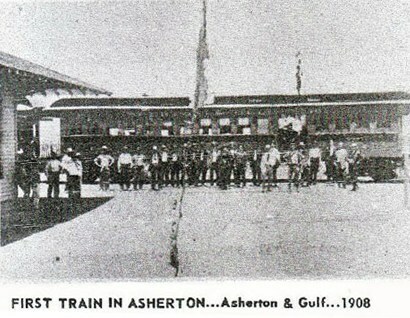 Asherton and Gulf Railway history, vintage photo. The railroad's offices had originally been in Carizzo Springs. From 1905 to 1909 the railroad was known as the Nueces Valley, Rio Grande and Mexico Railway Company. In 1909, 12 miles of track opened between Artesia Wells and Light, Texas and before the year was over, the last 20 miles between Light and Asherton were completed. Like nearly all railroads - most of the railroad's revenues were from freight operations. In 1916 the line reported passenger revenue of $5,000 and freight earnings of $26,000. The railroad at this time owned two locomotives and six cars. The Asherton and Gulf was absorbed by the Missouri Pacific Railroad in 1926, but continued to operate under it's own name until 1956. The line was totally abandoned in 1958. In 1916, the Angelina and Neches River Railroad (one locomotive and five cars) earned $6,000 in passenger fares while their freight receipts brought in $40,000. In 1916, the Asherton and Gulf Railroad (consisting of 2 locomotives and six cars) earned $5,000 in passengers fares and $26,000 in freight.